Indian Oil and Gas Canada (IOGC) is an organization committed to managing and regulating oil and gas resources on First Nation reserve lands. It is a special operating agency within Indigenous and Northern Affairs Canada (INAC). IOGC is responsible for oil and gas on First Nation reserve lands across Canada, but only a handful of reserves exist north of the 60th parallel. Therefore, practically all of IOGC's work is south of the 60th parallel, with most of that in the Western Canada Sedimentary Basin. secure compliance with and administer the regulatory framework in a fair manner. IOGC operates pursuant to the Indian Oil and Gas Act and Indian Oil and Gas Regulations, 1995, as well as other relevant legislation and guidelines (see Acts and Regulations). Oil and gas activity on First Nation reserve lands depends on agreements involving First Nation band councils, oil and gas companies, and Indian Oil and Gas Canada. V/O Narrator: Oil and gas on First Nation reserve lands has been regulated by the Government of Canada since before the 20th century. The Indian Minerals unit within Indian and Northern Affairs Canada was responsible for all oil, gas and mineral rights from the 1950s. The unit was split into East and West units in the 1970s. And, in 1987 Indian Oil and Gas Canada was established to manage oil and gas resources on reserve lands and to further First Nations efforts to manage and control their oil and gas resources. Located on Tsuu T'ina Nation lands at the western edge of Calgary, Indian Oil and Gas Canada, or IOGC, is a special operating agency charged with the obligation to manage oil and gas resources on First Nation reserve lands. IOGC is completely funded by the Government of Canada and no fees are charged to First Nations. The operations of IOGC are co-managed by the IOGC board, which includes members from First Nations, industry and the Crown. Indian Oil and Gas Canada currently manages oil and gas resources for more than 50 First Nations with active agreements. 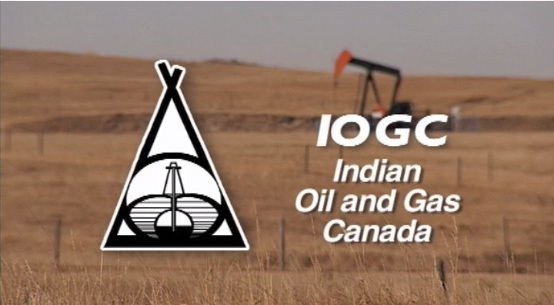 IOGC is comprised of four primary units: The Executive Division, responsible for communications, policy and the First Nations Oil and Gas Management Initiative. The Production Division deals with engineering, geology, royalties and informatics. Land Division deals with negotiations, contracts and environmental protection. Planning and Corporate Services provides financial, administrative and human resources support to the organization. Indian Oil and Gas Canada assists First Nations with all stages of resource management. Prior to entering into any leasing agreement, Indian Oil and Gas Canada confirms that the land has reserve title and has been designated for oil and gas development by the First Nation, which allows IOGC to manage the resource. IOGC assists the First Nation in the negotiation of subsurface agreements and ensures fair returns. IOGC drafts, issues and administers these agreements that allow companies to drill and produce oil and gas. Companies with exploratory licenses have access to conduct seismic activity. An environmental assessment is required as part of the license application. IOGC monitors environmental performance throughout the development and production cycle. Once a company decides they want to drill a well, a surface agreement is required. This provides companies with the right to construct surface facilities such as well sites, access roads and to construct pipelines. IOGC along with the First Nation ensures that the mandatory environmental assessment meets standards before granting surface lease or right-of-way agreements. Companies must submit a provincial well license to the First Nation and IOGC prior to drilling. IOGC collects data from drilling operations for statistical and other purposes such as interpreting the geology under the reserve. All aspects of oil and gas production are monitored by IOGC throughout the life cycle of the well; from drilling to abandonment. IOGC ensures that sound environmental standards are maintained and that royalties are accurately calculated and collected. A company must obtain written permission from IOGC, in consultation with the First Nation, prior to abandoning a well. IOGC checks the well for additional production possibilities. When companies are finished with subsurface agreements, they must give back, or surrender, the subsurface rights. IOGC reviews surrender requests in consultation with the First Nation. If the company is not in default of any part of the regulations or lease agreements IOGC will execute the surrender. Before a surrender of surface agreements is granted, the company must abandon any wells, remove any facilities, conduct remediation if necessary and reclaim the area. Surrenders are granted following inspection with the First Nation and confirmation that the reclamation is satisfactory. All revenues collected by IOGC on behalf of First Nations throughout the agreement life cycle are placed in regional trust fund accounts. This includes all bonuses, rents, considerations and royalties. First Nations can apply to Aboriginal Affairs and Northern Development Canada to access their moneys for community projects and other uses. IOGC is responsible for receiving, depositing and transferring the moneys into these accounts. With more than 70 staff, about half of whom are of Aboriginal descent, IOGC is committed to delivering excellence in service. There are opportunities in many areas of the oil and gas industry and IOGC offers good salaries in combination with a comprehensive benefits package. IOGC promotes work-life balance and offers flex time options.